I am a marine biologist and I have just returned from a trip surveying the seabed habitat in the Moray Firth, Scotland. Only three of my other crew members were marine environmental scientists, with the rest made up of engineers, boat crew and ROV (remotely operated vehicle) operators and the like. What suprised me about my fellow crew members (bar the three environmentalists) was the lack of knowledge about UK marine animals and the real interest every one had to learn about them. This is my inspiration for this post and a few to come. I hope to give some background information and facts about the weird and wonderful marine creatures that we find within the UK’s coastal and offshore marine environments. Although sea pens may look like plants, they are actually animals which are grouped together with corals and jellyfish in the phylum Cnidaria. Just like tropical corals, you may have seen on TV, these animals are made up of lots of tiny polyps which live together in a colony. 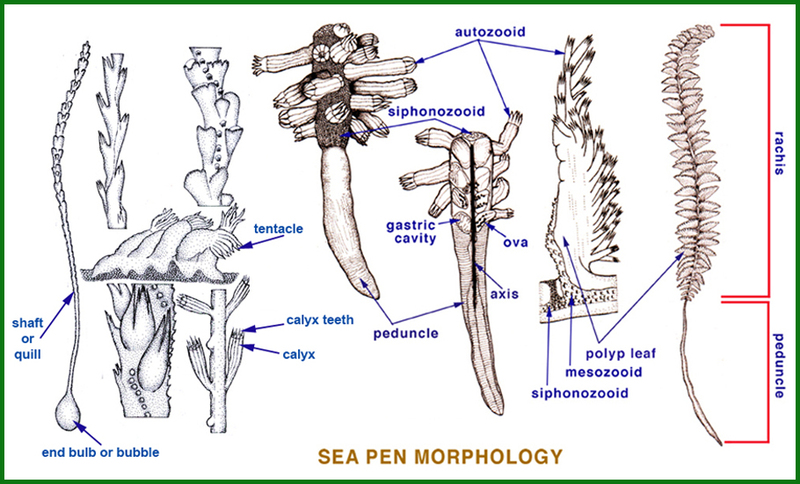 Sea pen polyps show polyp dimorphism, which means they all take on a specific role within the colony. One polyp adapts to become the central stem or axis, which contains a slender, unbranched, calcareous rod. The stem is split in two. The bottom half of the stem becomes a burrowing organ (peduncle) helping to anchor the sea pen into the sand or mud. The top half of the stem (rachis) then branches secondary polyps which form the ‘leaf-like’ structures. These secondary polyps can be split into autozooids which feed and siphonozooids which intake water (needed to hold the colony upright). 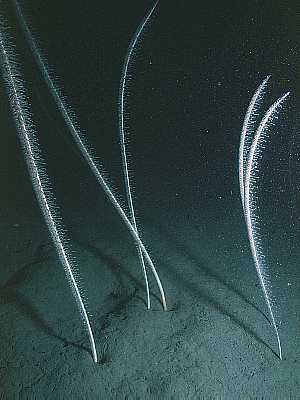 Sea pens are filter feeders, filtering plankton and other organic matter from the water column. Each autozooid polyp has eight tentacles which are used to trap food. The water taken in by the siphonzooids is circulated around the colony to allow the sea pen to remain upright. When disturbed, most sea pen species can expel the water and shrink towards the seabed or into a tube under the sediment surface. Three species of sea pen are well known in UK waters. They are the phosphorescent sea pen (Pennatula phosphorea), the slender sea pen (Virgularia mirabilis) and the tall sea pen (Funiculina quadrangularis). The slender sea pen can grow up to 60 cm in length. The polyps are arranged in clusters of 12, in two opposing rows along the stem (see the image below). The polyps are white to creamy yellow. In the UK, they are found in sandy to muddy seabeds in sheltered waters between 10 to 400 m depth. This type of sea pen is the most common species found in the UK and can be found all around our coast line, though they are less abundant in southern coastal waters. The phosphorescent sea pen is shorter than the slender sea pen, at around 40 cm long (25 cm above the sediment). Fused polyps form large triangular ‘leaves’, in alternate, opposing rows (see picture below). Polyps are deep, reddish pink due to the red sclerites (hardened, calcareous plate). As indicated by its name, the phosphorescent sea pen is bioluminescent. They can emit light in bright flashes or rhythmic pulses passing along the colony in a blue-green colour to warn off predators. Analysed samples of the phosphorescent sea pen have also found its cells to have narcotic and anorectic (loss of appetite) properties, to help ward off predators, especially the fish Dover Sole. 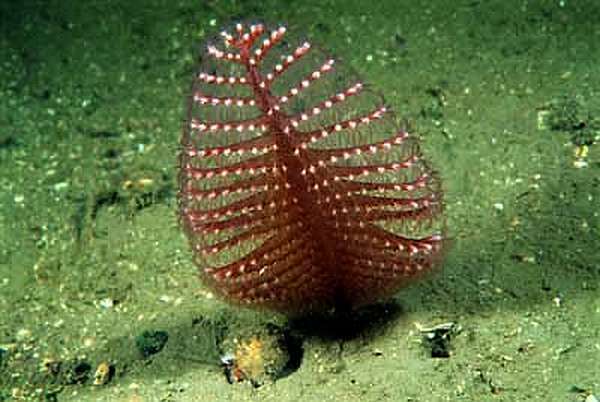 This sea pen is found in sand and mud sediments from 15 m down to about 100 m below sea level. They are found throughout the North Sea and the western British waters, but again are generally absent from southern UK waters. The tall sea pen can reach 1 m above the seabed. The white, yellowish or pale pink polyps are arranged irregularly along the stem (see picture below). The stem has a unique quadrangular cross-section. This sea pen has been observed in close associated with a species of brittlestar (Asteronyx loveni). 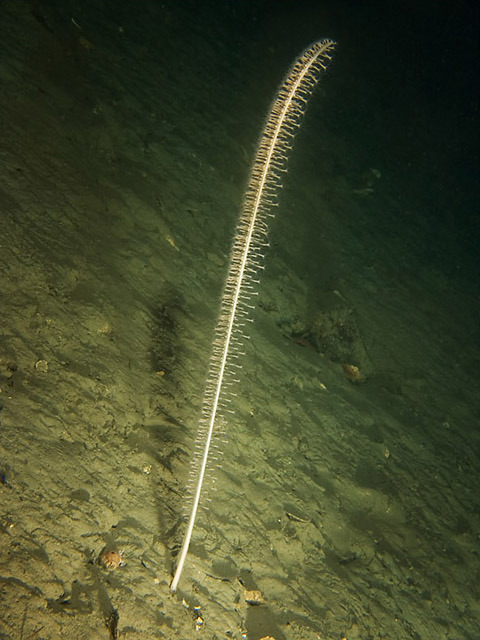 The brittlestar wraps a couple of its legs around the sea pen to remain elevated above the seabed to gain better access to food (see image below). This sea pen is in soft mud from 20 m down to 2000 m plus. It is only observed on the north and west coasts of Ireland and Scotland. The importance of sea pens in the UK marine environment is recognised by the UK government and conservation bodies. Sea pens make up part of the OSPAR threatened and/or declining habitat ‘Sea pens and burrowing megafauna’. This habitat if identified could lead to the area being designated a Marine Conservation Zone. The burrows, that are also present, are often made by Norway lobster (better known as scampi), mud shrimp or a type of fish, the Fries Goby. 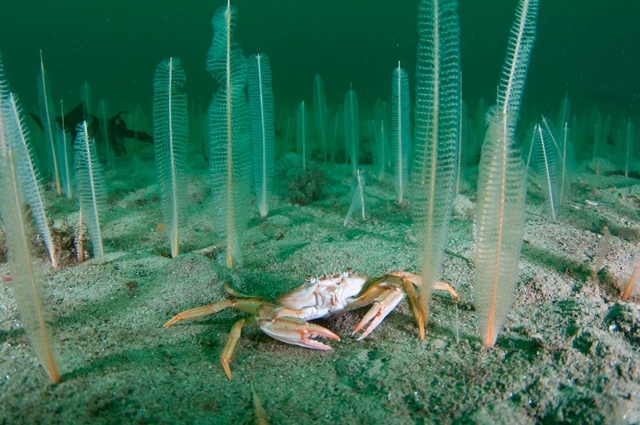 The biggest risk to this specific habitat and sea pens in general, is from physical disturbance of the seabed caused by fishing.